The port of Liverpool including the Mersey, Gladstone, and other Docks and the Harbor area. 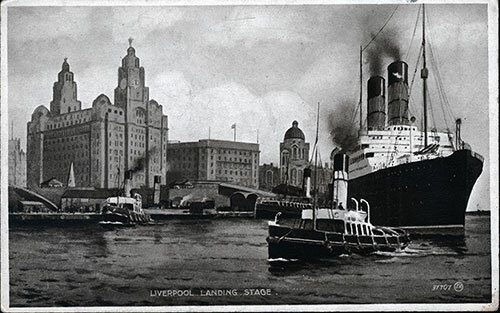 The landing stage was used by many of the great steamship lines including Anchor Line, Bibby Line, Blue Funnel Line, Canadian Pacific, Cunard, Cunard White Star, Donaldson, RMSP, Yeoward Line, and others. 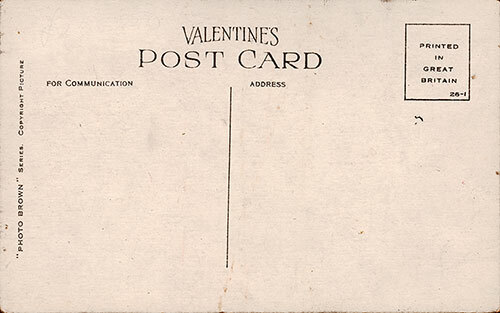 Part of Valentine's Series, this postally unused and undated postcard likely dates from around 1910. 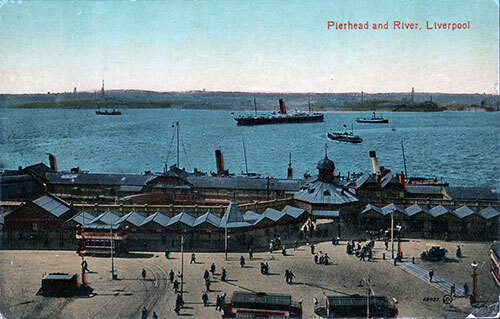 The original title of Pierhead and River was updated to the current use of Pier Head. If you look closely towards the left, a double-decker bus (motorized) is visible. They were in service from about 1906. 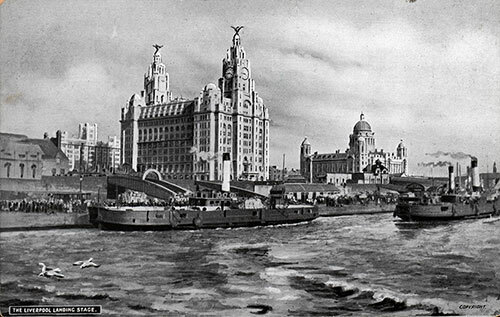 In the far background, you can see the Liverpool Dock Office building and just to the right of that, the Cunard Line building. 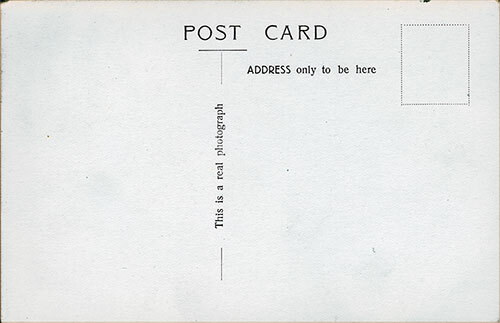 This postally unused postcard from Valentines' "Photo Brown" Series likely dates from the 1920s. 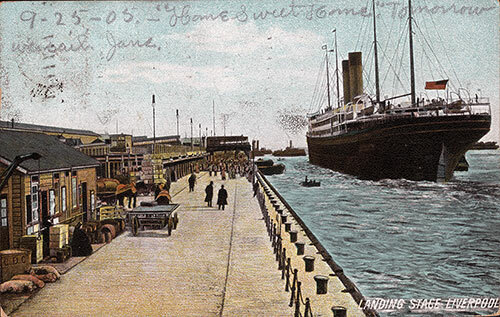 This early 1900s postcard shows some people strolling in the foreground, with a slightly dense crowd of people beginning with the first steamship in view and extending the remainder of the landing stage until out of sight. 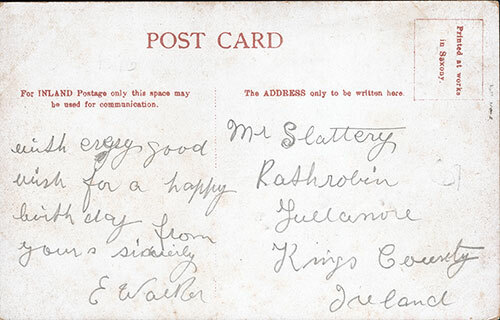 Birthday greetings are spread on the back of this postcard. 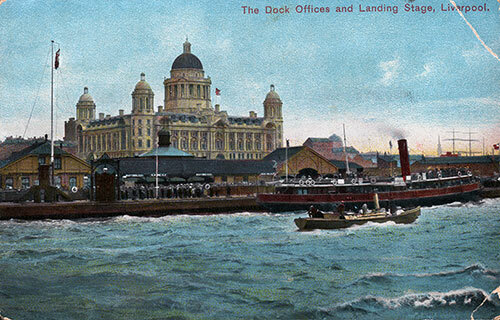 The Dock Offices loom large in the backdrop of the landing stage in what appears to be a windy day on the Mersey River. A tender is parked aside the landing stage with people waiting in the queue to board. 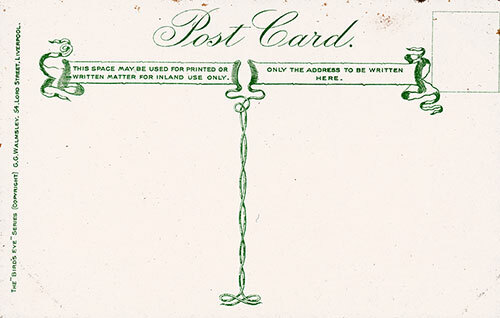 Postally unused, this PCNCL (Post Card Novelty Company, Liverpool) dates from the late 1800s to early 1900s. 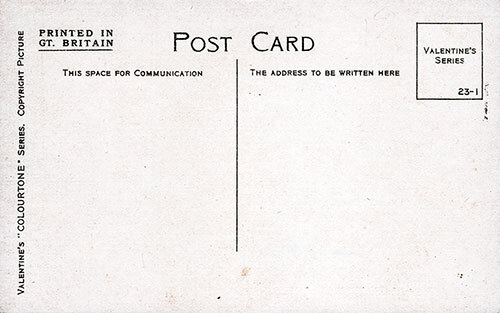 The postcard was printed in Germany. 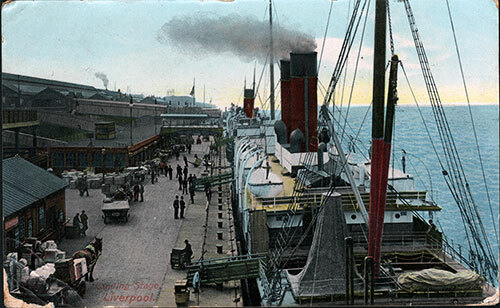 A Cunard Ocean Liner is boarding passengers with many folks waiting on the landing stage to see their friends and family off on their voyage. A sign on the bottom left reads "Daily Sailings -- City of Dublin Steam Packet Co. Liverpool to Dublin in EIght... [Hours]. 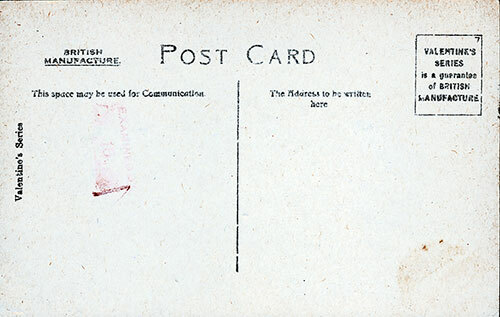 This Valentine's "Colourtone" Series postcard is postally unused, but likely dates from the early 1920s. This somewhat "Gloomy" image of the early 1900s was published by G. G. Walmsley of Liverpool in their "Bird's Eye" Series. Two small ships are visible while only one was secured to the landing stage. 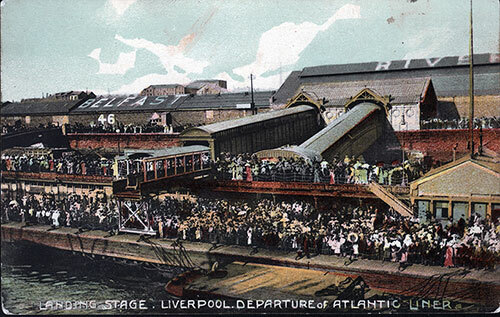 A large group of people is visible on the landing stage. 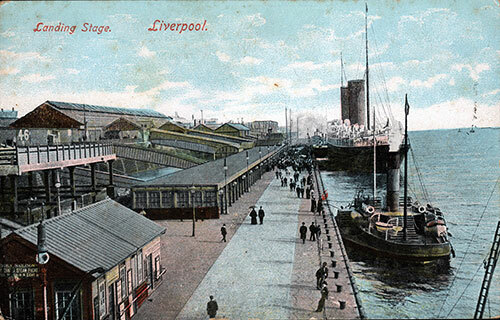 Postally used colorized postcard of the landing stage shows a view typical of the late 1800s. The painting depicts a large group of people gathering about where the American steamship will eventually dock. A horse-drawn flatbed carriage is clearly visible in the foreground. A Tug and small craft are noticeable in the water between the ship and the landing stage. 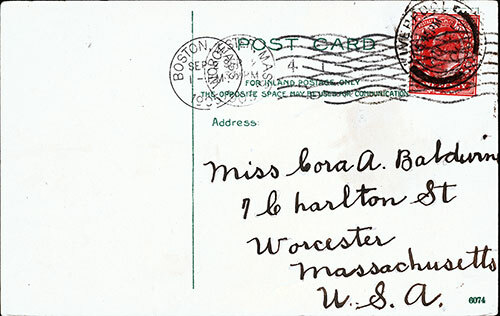 The Boston postmark was dated 2 September 1905. 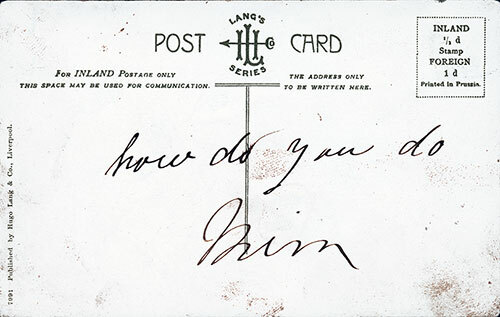 Postcard publisher was not disclosed but numbered 6074. Whatever happened here is left to the imagination. This postally unused card likely dates from the late 1800s to early 1900s is the first card we have encountered that doesn't show a steamship in view. There are a considerable number of people filling the lower and upper landing stage with Building 46 and the words "Belfast" and "River" clearly visible on the roof. 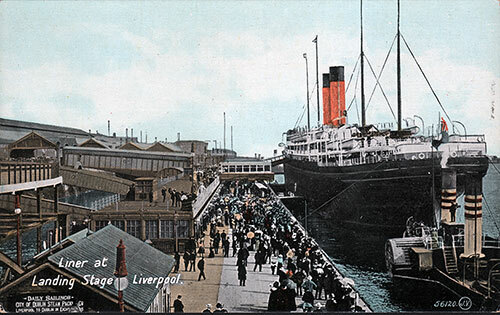 Postcard identified as #7001 Published by Hugo Lang & Co., Liverpool. 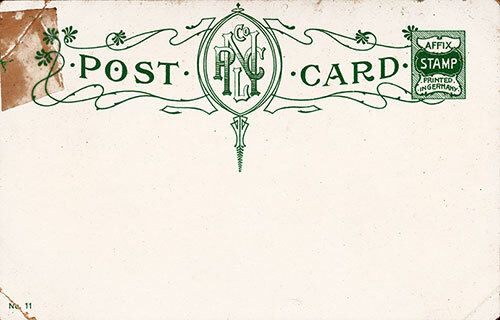 Beautiful F. Harmann postally used postcard is from their Real Glossy Series G. 1079/10, postmarked 25 July 1908. 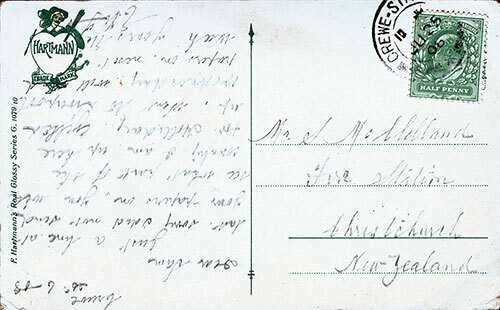 The message is unique in that it is written upside-down sent to a New Zealand address and postmarked at Crewe Railway Station in Crewe, Cheshire, England. There are several horse-drawn carriages on the landing stage which suggests this photograph dates from the late 1800s to very early 1900s. There are several ocean liners visible, two more clearly than the rest. The steamer in the foreground has smoke billowing from its smokestacks so it may be in the process of starting up for the next voyage. 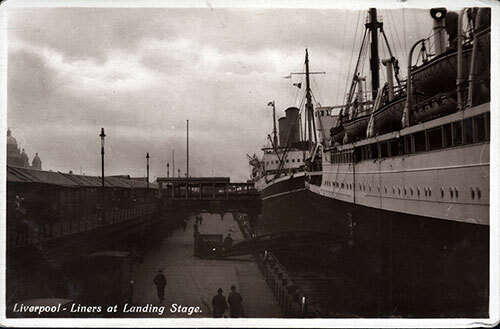 The landing stage itself is lightly populated.